RNA interference (RNAi) is an evolutionarily conserved mechanism of posttranscriptional gene silencing induced by introducing the double-stranded RNAs (dsRNAs) into cells. Recent progress in RNAi-based gene-silencing techniques has revolutionarily advanced in studies of the functional genomics and molecular therapeutics. Among the widely used dsRNAs including exogenously synthetic and endogenously expressed small interfering RNAs (siRNAs) and short hairpin RNAs (shRNAs), the shRNAs are more efficient than siRNAs on the induction of gene silencing and currently have evolved as an extremely powerful and the most popular gene silencing reagent. The DNA vector-based shRNA-expression systems provide not only a simple and effective way in inhibiting gene activities in either inheritable or inducible manner, but also a cost-effective tool in constructing the expression vectors. To fully explore the DNA vector-based shRNA-expression systems in RNAi-mediated gene-silencing techniques, four distinct RNA polymerase III (Pol III)- controlled type III promoter-based expression vectors are constructed including pHsH1, pHsU6, pMmH1, and pMmU6, which contain either the RNase P RNA H1 (H1) or small nuclear RNA U6 (U6) promoter from human and mouse. Moreover, to improve the constructing and screening efficiency for the shRNA-expression recombinant clones, these four DNA vectors are further reconstructed by inserting a stuffer of puromycin resistance gene (Puro R) between restriction enzyme ClaI and HindIII sites, which makes the preparation of vectors easy and simple for cloning the shRNA-expression sequences. Because of the ease, speed, and cost efficiency, these four improved DNA vector-based shRNA-expression vectors provide a simple, convenient, and efficient genesilencing system for analyzing specific gene functions in mammalian cells. 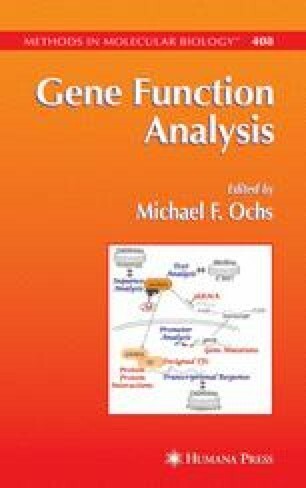 Herein, the simple and practical procedures for the construction of DNA vector-based expression vectors, potential and rational design rules for the selection of effective RNAi-targeting sequences, efficient and costeffective cloning strategies for the construction of shRNA-expression cassettes, and effective and functional activity assays for the evaluation of expressed shRNAs are described.